The surge swept away personal belongings of the owner's family — even his father's wheelchair. And it wiped out the investment that three brothers from India had spent years working toward. 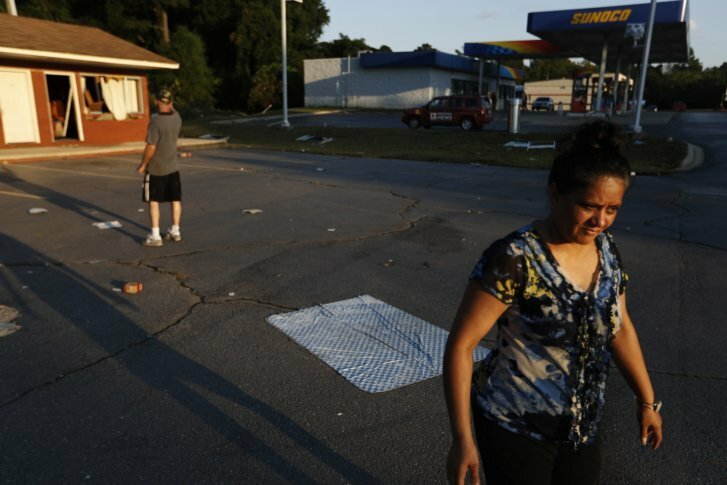 SPRING LAKE, N.C. (AP) — When the floodwaters from Florence receded, half the Starlite Motel was gone. A ragged lip of concrete edged parking spaces with no corresponding rooms, just a void of standing water and debris. Now, he’s not sure what will happen. He said the property in Spring Lake, North Carolina, didn’t have flood insurance . Depani, 50, who’s a U.S. citizen, said he and his brothers moved to this country so their children would have better educational opportunities. His only child, a son, attends the University of North Carolina. His brothers each have two adult children, one of whom is pursuing a second master’s degree and another studying to become a doctor. The brothers moved to the Fayetteville area because their sister owned a gas station there, which she later sold. Photos from before the storm show the single-story brick motel stretched out parallel to state Highway 87, its sign bearing the words “Starlite” in old-fashioned red cursive above “motel” in all caps. Nearby is a gas station, a gun store and a neighborhood of modest one-story homes. The motel built six decades ago sits with its back to the Little River, but the brothers felt it was a safe investment because Hurricane Matthew’s floodwaters in 2016 — some of the worst the area had ever seen — put only a few inches of water on the property. As Florence approached, Depani sent his family to stay with relatives in nearby Fayetteville while he remained in their apartment on the property to man the business. He was there when the storm hit early Sept. 14. Renters fled in such a hurry that they left belongings still hanging in one closet, a suitcase in another and golf clubs on one floor. “I’m so happy they were able to evacuate, because if they didn’t, it would have been really, really bad,” he said. Then he went to Fayetteville to wait out the flooding. As the water came in, he held out hope. He returned Sunday to retrieve some belongings and found only a couple of feet of water. A day or so later, while watching television, his worst fears were realized. On Wednesday, the waters had receded and Depani went back to survey the scene. He and his wife walked past torn-out bricks, window frames and shattered glass. They went back into their apartment — now uninhabitable — to look for what they could salvage. Lost were a new refrigerator and dishwasher, television, two laptops, phones and his father’s wheelchair. The three brothers had hoped the motel would be an early piece of a growing collection of businesses they could expand into other cities. They made a down payment of about $100,000 and still owe as much as $500,000 on the mortgage, Kishor Depani said — unable to say the exact amount during an interview because he believes mortgage documents were swept away. He said business was great at the motel, where he charged $46 to $56 per night. His wife helped him check in people, keep the books and launder the linens. He said he had exceeded the previous owner’s best months for sales and had been planning to remodel and upgrade the property. What is left standing now, he believes, will have to be demolished. He was optimistic that he and his brothers would bounce back despite the uncertainty of government assistance. But that doesn’t mean it won’t be painful. Drew reported from Raleigh, North Carolina.